Discussion in 'Food Plots for Wildlife' started by Jeff H, Feb 12, 2019. Good afternoon Mr Lashley. 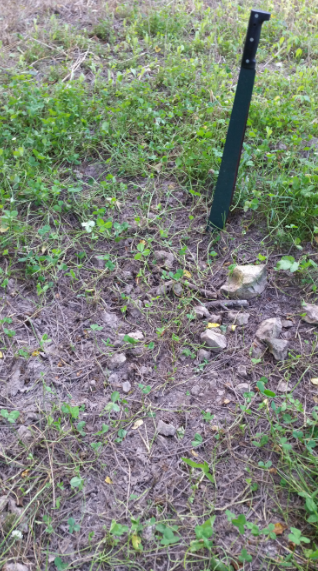 I recently heard you on the MSU deer university podcast speaking about mineral stumps. Pretty interesting stuff! With your knowledge and interest in plant biology I thought you may be able to help me with an interesting observation I made on my property in Missouri this year. 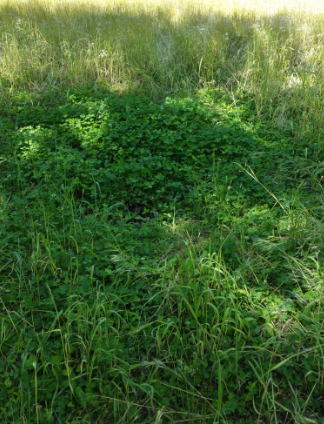 I have two small (1/4 acre) ladino clover plots that are approximately 5 years old. They sit on a ridge top with moderately dry conditions. The soil is rocky. The clover has moderate shade from Walnut trees. Last fall I over seeded them with ladino clover seed. They had also become over grown with fescue. On the edge of one of these clover plots I have a mineral site that is about 3 feet wide and maybe 6 inches deep. I say mineral site but all I put down was salt. I used it as a camera trap for a population survey. The last time I had any minerals in this spot was 2014 (I think). Since then there has not been any plant growth in this spot. When I over seeded into the clover plot last Fall I broadcast seed directly into my old mineral site for no particular reason at all. Weeks later I noticed clover germinating in the mineral site yet no other plants were visible. No fescue growing there at all yet 3 feet away fescue was 2 feet tall. I also noticed that the newly germinating clover plants inside of the mineral site were larger than those outside. Fast forward to the first week in May 2017. While spraying the clover plots with Cleth I noticed that the clover inside the mineral site was flush with growth. The plants were larger than those outside of the mineral site. The mineral site also had about 2 inches of standing water in it. Still no fescue within the site. The following week I mowed the dead fescue into the clover. Yesterday 6/15, I visited the site and found that the area had been browsed to the dirt inside of the mineral site. The clover outside of the mineral site had what I would consider normal browsing as was evident by an exclusion cage. So it appears that the salt has acted as a weed suppressant, a clover booster and as a deer magnet. Have you seen this before ? I have asked the question of many that are much wiser than I am and no one seems to have an answer. What have I done to my soil to create this anomaly? I’d sure like to replicate it. howboutthemdawgs, Mennoniteman and Jack Terpack like this. I am happy to hear you are enjoying the podcast. Please share with friends and family, the more listeners we have the easier we can justify keeping it going. That is quite an interesting observation. I have seen and heard about some similar observations, particularly with the way fertilizers are applied to sunflowers. However, I have never seen this from a salt lick like you observed. I did a little digging and found a few things that may be going on. One, the Na absorbs and binds water which may make the soil moisture optimal for clovers. Also, most plants do not have a high tolerance for Na in soils, but white clovers in particular are salt tolerant and many grasses are sensitive to Na levels. So, you may have inadvertently improved the soil for the clover by increasing moisture retention and simultaneously decreased the soil quality for the competing plants. The more active, vigorous growth of the clover with more water should also improve palatability which may be why deer liked it so much. There is not much research in this area, so I am not sure if this is what was going on or not, but it is the most plausible explanation I can come up with. Hope this helps and thanks for tuning in! dogghr, Chipdasqrrl, JohnL48 and 1 other person like this. Your discovery is interesting, I'm always intrigued by experiments that are outside the box, and I've studied the effects of salt on cropland. We always put our leftover icecream making ice/salt on our asparagus patch for weed control, but I'd be slow to put salt on large ares of cropland, there's many articles that mention the negatives of salt for crops. Among the stresses in plant agriculture worldwide, the increase of soil salinity is considered one of the major stresses. Reduction of water quality for users, sedimentation problems, increased leaching of metals, especially copper, cadmium, manganese and zinc. soil erosion ultimately, when crops are too strongly affected by the amounts of salts. Penn State University https://extension.psu.edu/saline-soils-and-plant-growth also says clovers (alsike, red) are very sensitive to salt. Are you sure that the area was grazed and not killed by the cleth? the picture looks more like the spray killed it? I'd say keep experimenting further with that spot and let us know what you are learning! This was not actually an experiment. It was a discovery. Totally inadvertent. When I was over seeding the plot I made no attempt to keep the new seed out of the mineral site. As small as it was I was not concerned about the loss of seed. I gave no thought at all to how the seed there would react. Nothing had grown in that spot for years, I assume due to the high salt content. Keep in mind the site had not had salt added to it for 3 years. I'm going by memory now from two years ago but I don't believe I sprayed that specific spot with cleth. I was using a backpack sprayer, not my tank sprayer so my coverage would have been pretty specific. Thinking about it in a practical sense why would I? There was no grass in that area to kill. I have several similar ladino clover patches with mineral sites, I will definitely be watching theses areas for similar results, and now you've got me thinking of spreading some salt into maybe about a 10X10 area of nice white clover and an exclusion cage in front of a camera just to satisfy my curiosity into your observation. TreeDaddy, Jack Terpack and Jeff H like this. Thank you for re-posting this Jeff. Like Mennoniteman I intend to try salt on different and small test sites in clover to see if it is repeatable. We've known for years that river bottoms grow better trees, grasses, forbs etc.. River bottoms typically grow better deer as well. Why? Better soil? probably. What's better about the soil in a river bottom? Many answers here but one of those answers is a higher concentration of minerals. Dr Lashley has done extensive research on mineral stumps which is where we crossed paths. He has shown where trees (even trees with low palatability) are severely browsed after being cut 2-3 ft above the ground. Why? Higher concentration of minerals. In a nutshell the root system doesn't know that 90% of the tree is gone so it sends the same amount of nutrients to the remaining 10% of the tree resulting in a super concentration of minerals in each leaf that sprouts. Is it that difficult to believe that a highly water soluble and salt tolerant plant such as white clover can do the same as a tree in a river bottom or a mineral stump? I believe I made this little spot of ground mineral rich and the plants liked it and the deer liked the plants. Perhaps we had a wetter than normal Spring and that made a difference. Perhaps the soil had leached enough salt from the soil so that only plants that tolerated salt would grow. Now the following Spring I put 50 lbs of Redmond fine minerals on half of that 1/4 acre clover plot. I had exclusion cages in each section. I saw no noticeable difference in plant growth or browse. I've done nothing to it since. Maybe I will again this Spring. Interesting and I like your analogy with mineral stumps as I will certainly attest that deer love those low stump sprouts keeping them trimmed with browse for many years. I'm gonna have pay more attention to my areas of mineral licks. Thanks for sharing. I think the difference is in the volume of salt or minerals used. Mine was also devoid of any growth for 3 years, then flush with growth. Never is a long time ! Yep, I’ve noticed that weeds grow extra high around the stumps on our lease (pine plantation). I put salt on an asparagus patch to kill the grass, it works. My problem was that the salt drew deer into my garden, while they were there they ate all the asparagus to the point they killed the 2 year old patch. A trick my uncle pulls is to spray the patch with roundup early, once the grass is green, but the spears haven't emerged. So asparagus might be a great food plot planting! It sounds like it but in my experience is that the deer just won't let it grow. If one could plant a minimum of four acres of it like beans it could work but it doesn't work that way. I've had luck with coarse wood chips on top of asparagus too. The spears can push through it quite easily where grass has a much harder time.